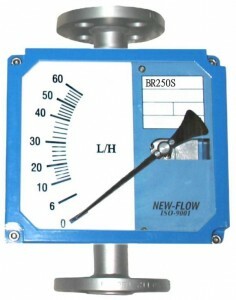 BR250F for High flows of gas, liquid and steam. Material: Aluminum alloy case with paintl SS316 available. Body wetted parts: SS316, Others on request. Indication via magnetic, coupling(no sealed). Scales calibrated: in l/h, m3/h, kg/h, %, etc. Connection types: Only Flange type. Connection size: 1/2" ~ 4"
Mounting: Vertical and Horizontal available. Mounting Length: 250mm Standard; Connection size bigger than 3", mounting length is 300mm; 300mm for Explosion proof. Protection class: IP65 or Explosion proof, CLASS I, GROUPS B, C&D; CLASS II, GROUPS E, F, &G; NEMA 4, 7, 9. Alarm Switch: Micro switch, Inductive switch, Reed switch available.